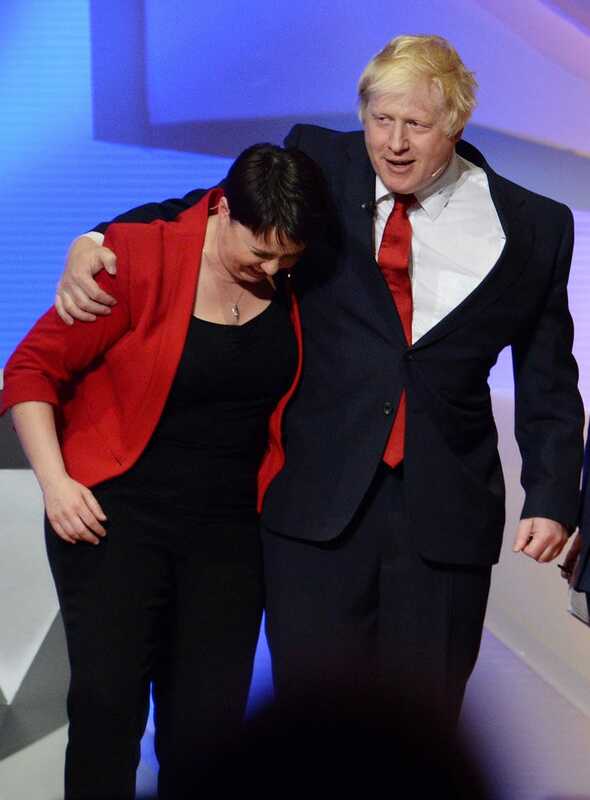 Stefan Rousseau-WPA Pool/Getty ImagesScottish Conservatives leader Ruth Davidson (left) with former London Mayor Boris Johnson at the European Union referendum debate at Wembley Arena in London on June 21, 2016. Should we vent our rage at the institutions we are dissatisfied with by replacing them with some unspecified, nationalism-inflected replacement? In Britain, it’s Brexit; in France, it’s Marine Le Pen; here in the United States, it’s Donald Trump. Ruth Davidson, who leads the Scottish Conservatives, made a strong argument during a Tuesday debate about the risks and uncertainties associated with leaving the European Union. And the argument applies equally to the risks and uncertainties of making Donald Trump president. You might be unhappy with the way things are now. But Something Else is not a policy. You have to weigh your dissatisfaction with the current system against the problems that could be associated with the replacement. “I know some people find the EU a bit frustrating and fussy,” Davidson said. The question for voters is, even if you dislike the EU, do you know enough about the consequences of Brexit to take the plunge? In the case of Brexit, changes would bring significant economic turbulence due to interference with international trade, without actually freeing Britain from European regulations (since British businesses will still have to follow them to do business in Europe) or from European immigration (since other countries, like Norway, have had to agree to free movement of people to gain access to the European trade area). Brexit proponents, including Boris Johnson, have dismissed this line of attack as “Project Fear.” But the point is there’s much to be afraid of: Britain could be doing better than it’s doing right now, but it could also do a lot worse. There’s a reason Britain’s stock market and the British pound rise on news that makes Brexit look less likely, and fall when it looks more like Britain might leave. There is risk associated with change, and that risk is costly to the economy. Britain might be able to smoothly rebuild its international trade relationships without the benefit of the EU-wide single market and EU-negotiated trade deals, or it might not. It’s not good enough to note that the effects might not be so bad. You need to know with a high degree of certainty. This anti-Brexit argument is very similar to the one being advanced by Hillary Clinton and her supporters. You may not like the status quo that Clinton represents, and you may prefer a different direction for the country. But the options on the ballot are not Hillary Clinton vs. Something Else. They’re Hillary Clinton vs. Donald Trump, and you need to consider the full range of possible outcomes associated with a Trump presidency — some of them very bad. Fear can be a perfectly reasonable reaction to the prospect of radical change. People should be afraid of destabilizing the institutions that hold together the global economy, whether that destabilization comes from Brexit or from a Trump presidency.